Ansel Adams was born February 20, 1902 in San Francisco, California. His father was Charles Adams, and his mother was named Olive. In the earthquake on April 18, 1906, the Adams' house was damaged, but they were still able to live in it. Most of the inhabitants of the city were left homeless. In an aftershock* the young boy Ansel, then four years old, was tossed around and his nose was broken. For the rest of his life he had a crooked nose. His family was wealthy when he was young, but they suffered financial reverses and went from having a cook, a maid, and a governess to doing everything for themselves when they could no longer afford to hire help. Ansel was homeschooled by his father and his Aunt Mary until he was nine years old. Then he was put in various schools, but he did not do well. He was a very nervous, hyperactive child. His father saw something special in his son and did his best to nurture* him. He removed him from the school and hired tutors to teach him algebra and Greek. Ansel became interested in the piano, taught himself to play, and began to take lessons. Music provided the structure that had been missing in his life. He learned how to play in a couple of months and his father bought for him a $6,000 piano, paying it out by installments. When he was thirteen his father bought him a one-year pass to San Francisco's Panama Pacific International Exposition. * This would be his schooling for a year. He went to the exposition every day. It was at the Exposition that he first saw displays of art and pictorial photography. The following year he was captivated* by a book he saw about Yosemite, then his parents took him on a trip to Yosemite. First they traveled by train, then by bus to reach the area. His parents gave him a Kodak Brownie box camera with which he took pictures at Yosemite. This trip was actually the turning point in his life. Back at home he would practice the piano for six hours a day. He had decided to become a concert pianist, then in the summer he would return to the mountains. While he was in the mountains the only place he had to practice the piano was at Best's Studio owned by Harry Best. Harry also had a daughter named Virginia, who eventually became Ansel's wife. He was twenty-six years old when they were married. He and Virginia moved into a little house at the back of the studio and raised their two children there. Best's Studio would later become known as the Ansel Adam's Gallery. He continued with his work as a professional* photographer, and after having some success at selling some portfolios of his prints, he saw he would be able to make a better living as a photographer than as a concert pianist. 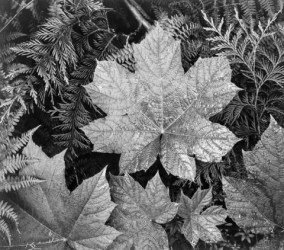 He experimented with different filters on his camera and different ways of developing the prints. His photographs became works of art. By 1935 he was recognized as one of the best photographers in America. Wealthy people began to hire him to make portraits of their families and pictures of their homes. 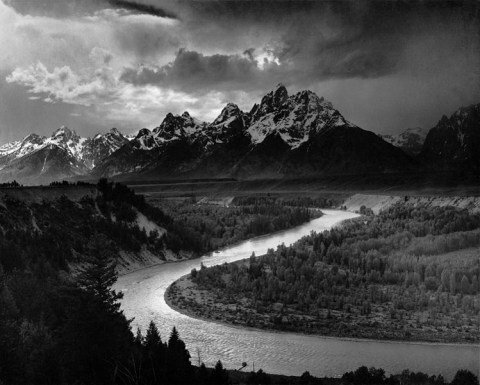 Ansel Adams specialized in black and white photography. Sometimes it would take him a whole day to print a picture to make it look exactly as he wanted it. One of his most famous prints is Moonrise (use the right arrows to view other prints). Alfred Stieglitz offered him a one-man show in New York. It was the opportunity of a lifetime. He worked so hard that summer preparing for exhibits he worked himself to exhaustion. It took him months to recover. Adams had been active in the Sierra Club* since he was a teenager, and now he was on the board of directors. In this way he helped to preserve the environment. His book of photographs, Sierra Nevada: the John Muir Trail, when given to President Theodore Roosevelt helped to influence him to support King's Canyon as a national park. The Department of the Interior commissioned* him to make a set of murals. They are featured in a book Ansel Adams: The National Park Service Photographs. Adams published numerous books of his photographic work and books about photography. To share his knowledge he held workshops to teach people photography. He was a great teacher. In 1980 President Jimmy Carter awarded him the Presidential Medal of Freedom which is the nation's highest honor given to a civilian. In 1983 he visited his beloved Yosemite for the last time and died the next year on April 22, 1984. He was 82 years old. 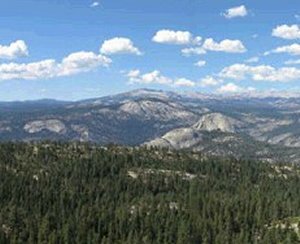 Six months after his death Congress set aside some land in the Sierra Nevada area of California they named "Ansel Adams Wilderness", and a mountain was named in his honor, "Mount Ansel Adams". Press "Go" to search for books about Ansel Adams. This page displayed 87,126 times.